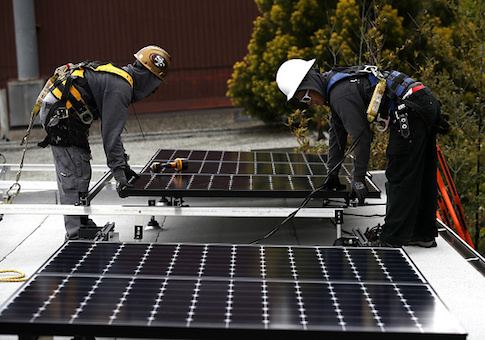 California will mandate solar panels on new homes out of concern for climate change, a policy that will raise prices in the most expensive home market in the country and does little to decrease the state's carbon footprint. The five-member board of the California Energy Commission unanimously issued an edict Wednesday requiring all new homes to either be installed with solar panels or share solar power in a group system. The rules go into effect on Jan. 1, 2020. The New York Times called California a "trendsetter" for the move, but expressed surprise that such a costly rule would be approved outside the legislative process by the commission with "little debate." "It will add thousands of dollars to the cost of home when a shortage of affordable housing is one of California's most pressing issues," the Times reported. "That made the relative ease of its approval—in a unanimous vote by the five-member California Energy Commission before a standing-room crowd, with little debate—all the more remarkable." "The requirement is expected to add $8,000 to $12,000 to the cost of a home," the Times added. The costs come to consumers already in a market where the median price of a single-family home is $565,000, one of the highest in the nation, the Wall Street Journal reported. MIT Technology Review reported requiring every new home to have solar panels is a "feel-good change" that is both expensive and does little to reduce carbon emissions. "A solar panel on every house might sound good, but it isn't smart climate policy," said James Temple, writing for the Massachusetts Institute of Technology magazine. The "big problem" is cost, Temple said, citing Severin Borenstein, an economics professor at the University of California, Berkeley. Rooftop solar panels are a "much more expensive way of increasing renewables on the grid," costing between 12.9 and 16.7 cents per kilowatt-hour, more than twice the cost of utility-scale solar systems, according to the report. "By demonstrating a very expensive way to reduce greenhouse gases, I think this could very likely be used in other states and countries as an argument against moving towards renewable energy," Borenstein said. The California Energy Commission claims the added costs to homes will be more than made up for in energy savings. If they save on electricity bills, however, it will be because customers who do not have solar panels are subsidizing them. The savings are "effectively subsidized by other ratepayers without solar panels, net metering and solar tax credits," according to Borenstein. Furthermore, MIT reported emissions reduced by the government mandate would not make much of a difference for the state's carbon footprint. "California estimates that the new rule will cut emissions by 1.4 million metric tons over three years, which is a small fraction of the 440 million tons the state generated in 2015," the report said. Emissions would be reduced by 0.32 percent. This entry was posted in Issues and tagged Solar Energy. Bookmark the permalink.